Take 42% off the entire book. Just enter code slwilliams into the discount code box at checkout at manning.com. This bestseller has been updated and revised to cover all the latest changes to C++ 14 and 17! 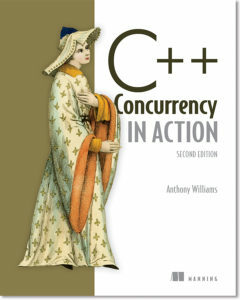 C++ Concurrency in Action, Second Edition teaches you everything you need to write robust and elegant multithreaded applications in C++17. You’ll discover the basics of starting new threads, how to synchronize operations between threads, designing multithreaded algorithms and data structures, and more. Along the way, you’ll learn how to navigate the trickier bits of programming for concurrency while avoiding the common pitfalls. 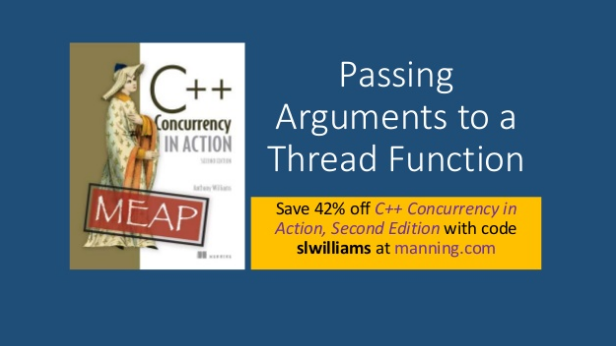 See how to pass arguments to a thread function in the slide deck below.